I’ve been asking arund a lot the last couple of days to find a Neugart gearbox. Now I finally found a source, which even has 5 of the gears for sale in slightly used condition. 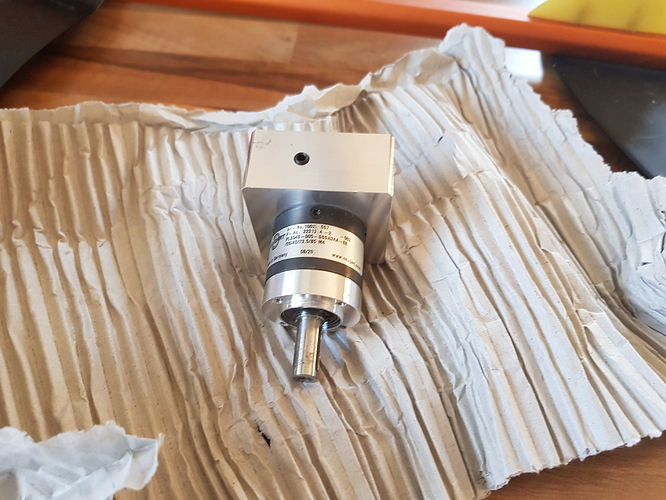 They have the wrong motor adapter, some really big aluminum block, so that has to be changed from neugart to the small, more compact adapter flange. I am still waiting for Neugart to send the offer for changing the flange, but the gearboxes itself are 110 Euro. Plus VAT and shipping. I think thats still ok. I only need oone gearbox, so 4 would be still available. Ok, got some feedback finally. As said above the gearbox itself is 110 Euro. They are the latest revision. Unfortunately the cost to have them modified by Neugart is 90 Euro. All prices plus VAT and shipping cost, which we could split of course. Have you got the gearboxes? Why does Neugart need to change the adapter? yeah, but I ordered not all of them. The flange is really big. It would work like this, but the pipe to put motor and gearbox in would have to be around 80mm, so 20mm more. Surely people could get their own flanges made or make them themselves if they have the equipment? Then the gearboxes would only be the 110 cost? Possible to buy from this outfit from the USA? I would be keen as I can manufacture a new flange. Is the gearbox complete that you received, including input drive boss? I suspect some used units could be missing this. Just for interest: do you have a picture of the other side? 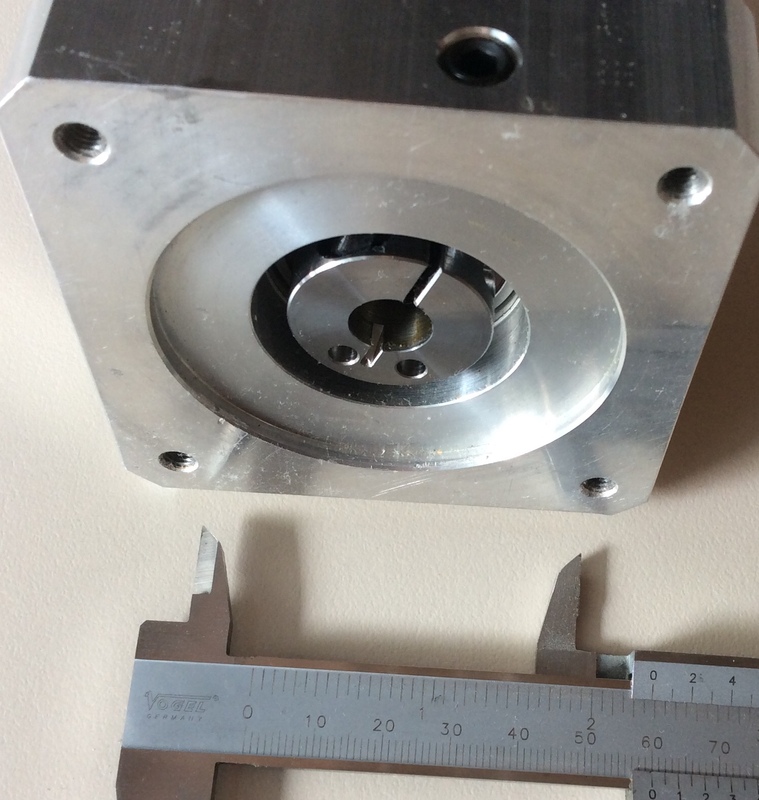 Is it maybe possible to just mill it down to 56mm diameter and add new threads for mounting? That‘s what I will do with my PLE 60 if I ever get around to try a geared propulsion unit. Unfortunately the PLE 60 has a lower input RPM rating. As you can see from the images below, the round centering pocket on the back is about the same diameter as the housing of the gearbox. I would just clamp it in the lathe and machine it down to the same diameter. Maybe machine a fitting blank first to use the centering for best results and use the tailstock, too then. How easy is it to remove the big square mounting block? Whats left one its removed? So you want to mill it down to 60mm? Which motor and tube will you use then? 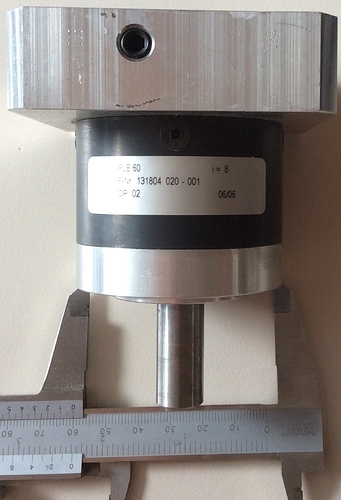 because the motor has ~55.95mm and the standard 60mm OD aluminium has 56mm ID. So it is a little press fit (because the tube is not perfectly round) which is great for heattransfere. Other thing is mounting: how will you attach the screws to the motor (and to the gearbox at the same time, if you use a adapter plate). Just open the 4 black torx radial screws around the gearbox (you can see one at first picture). Then the big aluminium block comes off and if you don’t pay attention your planets (and bearings of those) fall out (the bearing is an open nadele bearing). Inside the big block is the sun gear and the clamp for the motor shaft (in the middle of those is bearing (closed ball I guess ). I did not try to pull apart those, but I guess they are just pressed in there. You should be able to clamp the whole block and just let the sun gear clamp for the motor shaft in there. At the moment I only did some sketches and CAD as I‘m still using my direct drive unit. I want to do some pipe sections and machine them on the inside, too. This way I hope to get optimal fit and heat transfer. I still have to figure out how to keep everithing lined up and stiff against bending when I do the sections. I think I can not machine more than 10 to 15cm on the inside and this will already take some time with light cuts and a very stiff boring bar. If we want to discuss this further we should probably splitt off a new thread and stop hijacking this one. I tried to open my gearbox, but almost stripped the screwheads. Mine are propably threadlocked in there. I would have needed some heat to remove them. As I would have opened it mostly out of curiousity I stopped before I had an hour long reassambly ordeal. Look on the neugart Website, there are Crossections and CAD files. One of the gear heads is still available. Price ended up being at 240 Euro. I can supply all the Neugart bills for warranty reasons of course. You’ve a message… If it’s available, consider it as sold! @Levelnull have you still got one available? I’ve got the big aluminum block on my gearbox. It’s no issue. I’ve got a modified PM cad parts to accommodate. Smarm, there seem to be different large adapter blocks. This one was extremely large and I think larger than the ple60 size. I’m trying to get a PLE 40 5:1 and it seems a bit complicated. How/where did you get it at the end? if you have any suggestion…thanks!